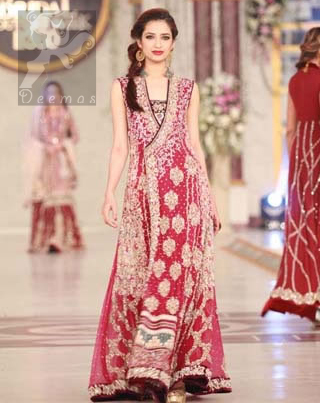 Tags: Angrakha, Bridal, Light Brown, Shocking pink, Walima & Second Day. Dupatta contains large border on front side and comparatively lighter work border on rest of the three edges. Work includes kora, dabka, naqshi, stones, sequins, beads, silk threads and swarovski crystals.